AlwaysFreshFish.com we use only the freshest Pollock available to cut into fillets. The Pollock used for fillets are mainly from the North Atlantic coast of the United States and Canada. This fish is firmer than it's Pacific cousin. Pollock fillets are slightly darker in color and have softer meat than Cod, with a higher fat content. Pollock is an excellent substitute for Codfish. 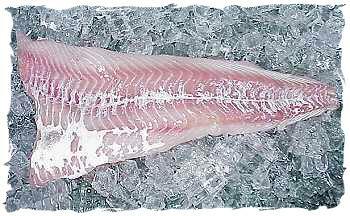 Your fresh Pollock will be cut from 16-24 ounce Pollock fillets. 1 lb. Fresh Pollock + 4 lbs. Add. Selections = 5 lb. Total Order OK! Rinse Pollock fillets under cold water and let drain. In a skillet, heat Oil and saute Garlic until soft. Stir in Tomatoes, Mushrooms, Peper and Basil. Place fillets in sauce and cook app. 8 minutes or until fish flakes easily. For additional information on Fresh Pollock, please e-mail AlwaysFreshFish.com.